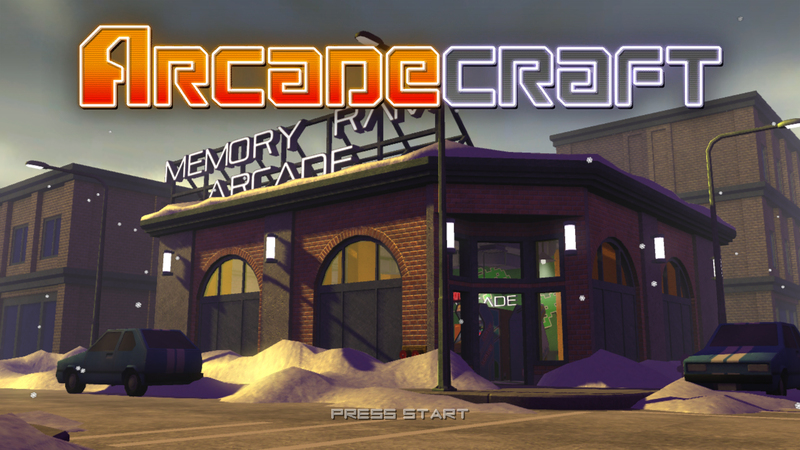 You have probably been wondering what has been going on with Arcadecraft. Well, here are some answers for you! First of all, we ran into a really ugly memory problem. Basically as we have been adding certain features to complete and flesh out the game we also started running out of available memory. Arcadecraft, by its design has to hold a lot of stuff in memory at a time. 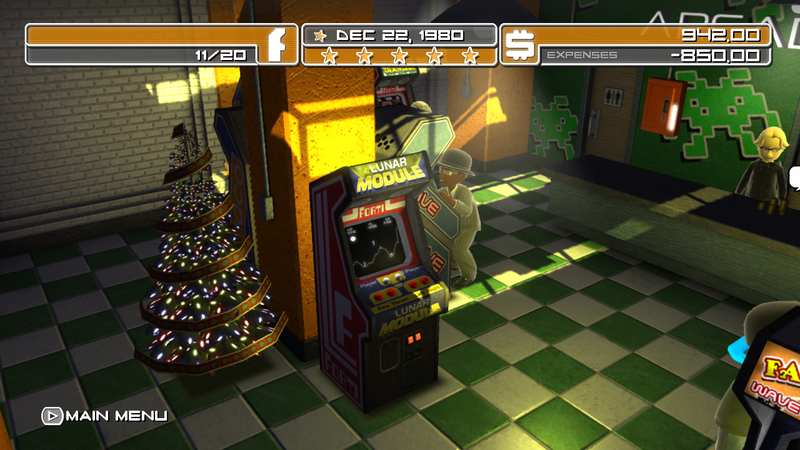 The city block, the building, the avatars, the user interface, and the arcade game cabinets. We don’t have a lot of flexibility with our memory for most elements of the game so we have to be very careful and optimize the material that is available. What you will notice is that the main cabinet texture now contains the monitor frame as well as the coin slot, but more texture room for the company logo side art. 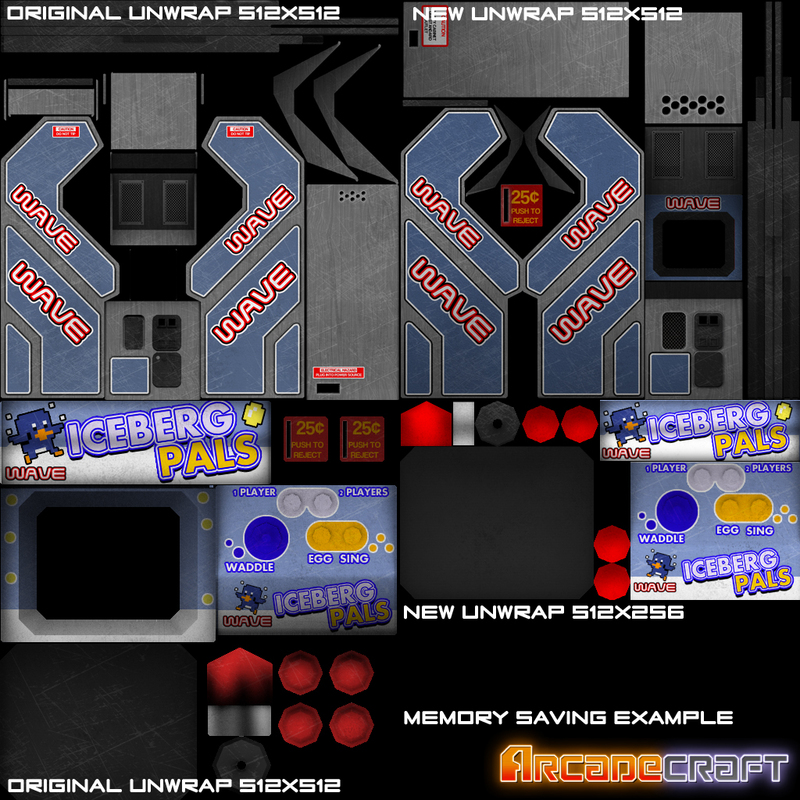 The control panel texture was drastically modified so it takes up 1/2 the amount of space of the original. Really, the only serious resolution drop was in the marquee, which is unfortunate but you cannot tell in gameplay. The control panel itself is only 5% smaller and the monitor size is indentical. Every machine had a dedicated 512×512 colour, and emissive texture. Now with change to 512×256 maps for every machine we get double the amount of machines in the same memory space as before. The cabinets also got modified. The original models were a bit of polygonal overkill. A lot of the budget was spent on the coin slot area which is barely seen in game. Changing this to being more texture dependent saved polys and performance. The other change was that the rubber stripping along the edge of the machine had a centimeter of extra depth which is now gone. With these changes, and a once over of the textures, the machines actually look a bit better than they did in the past and render faster! 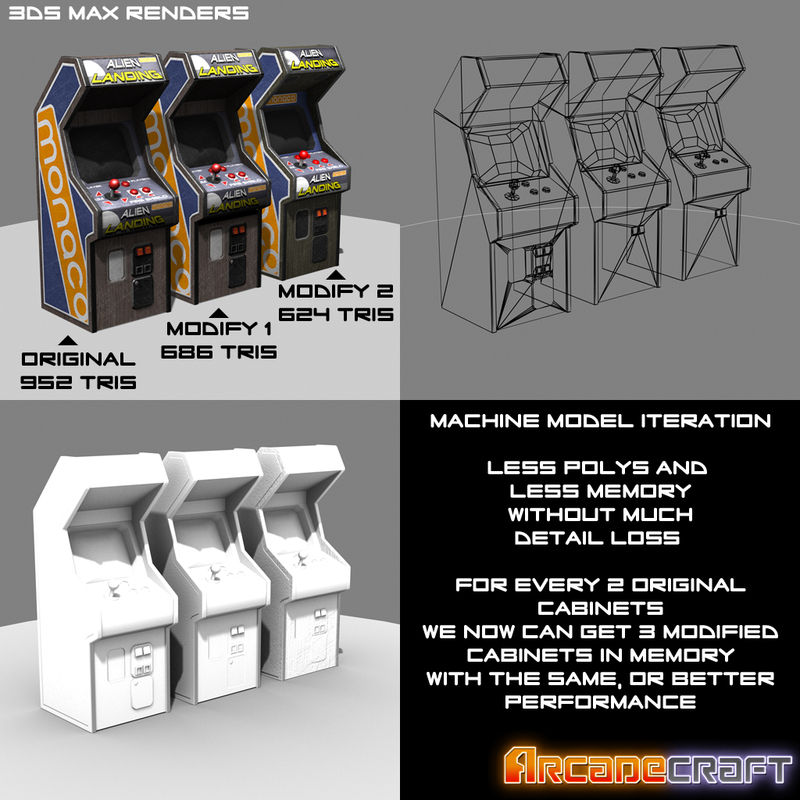 Those two big memory changes needed to be propogated over the 60 arcade games in Arcadecraft and unfortunately it took a very long time and a lot of manual labour to make it happen. Now with it near complete the user can currently have up to 30 unique machines in their space. Hopefully these changes have mitigated the memory problem once and for all. To be clear, we still have higher resolution source for everything so a future PC release, if it ever becomes a reality, will see a visual upgrade even with these changes. Like we alluded to in a previous post we have added the Import Salesman, Kenji Hase! 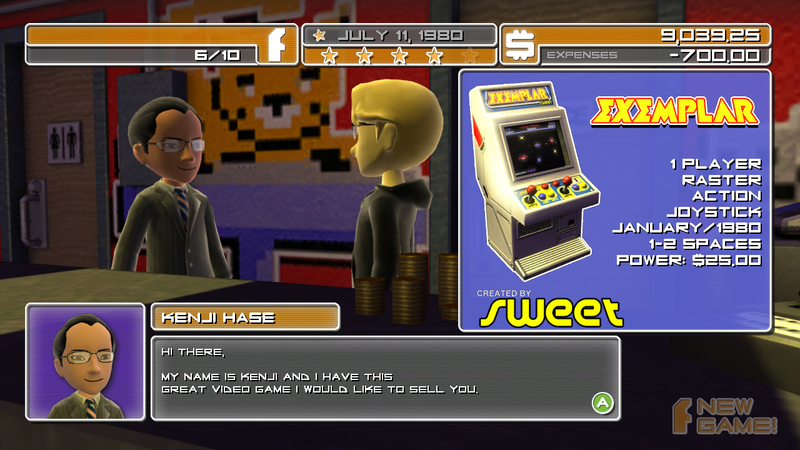 He is a Japanese businessman specializing in grey market arcade machine sales. Once a year he visits your arcade and offers the latest import for you to purchase! Just be sure you have the money on hand because if you don’t buy the machine then and there you can’t get it again! 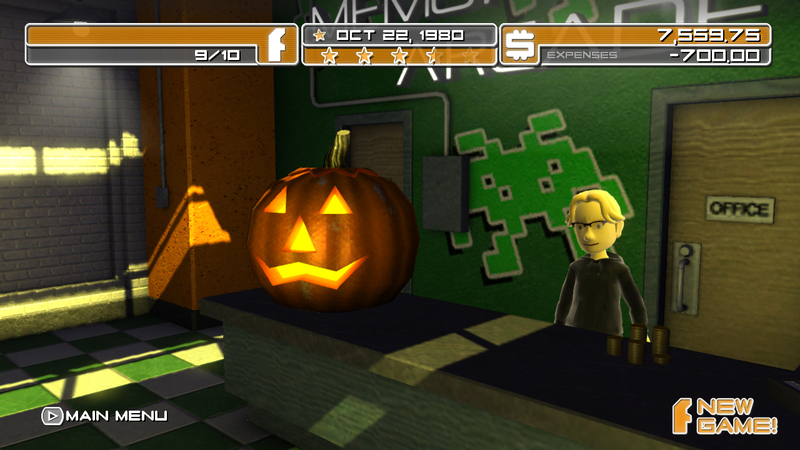 Yes Halloween is long past now but we have added in a couple of Seasonal Decorations for your arcade! Christmas is on its way so buy and place a tree! Both items become available for a month and a half before the holiday date and expire in 45 days after purchase. Both of them bump your arcade popularity up a 1/2 star while they are present and need to be repurchased every year to get that bonus. We may add a couple more for other holidays or special events! Speaking of seasonal effects, we are considering altering the exterior of the arcade with snow, rain, leaves, etc. This screenshot shows a early attempt at showing snow changing the environment! Other recent improvements and changes have been the addition of the power square. It is a tile that appears within your arcade and if you place a machine over that tile it increases the machines popularity substantially. The economic system of the game is firmly in place and functioning very well. We have also added a big dollar sign icon that appears above machines that have paid themselves off. The stats screen has been improved to show monthly and life to date expenses and revenue. It also says what machines you have bought or sold, repairs made, customizations purchased, etc. The machine info screen now shows how much money you have spent on a machine’s repairs over time. The same panel for the Jukebox shows the current music track playing. There are three more big changes to the game yet to come and all are pretty important to how the game plays as well as offering strategic choice. Two of these changes we will talk about in a future update, but one of which we are open to talking about is the “Classic” mechanic. After a machine is no longer available to buy from the store, it will become a “Classic” These Classics do not make a lot of money, in fact they barely break even on their power costs. However, a healthy selection of Classics improves your overall arcade popularity. They don’t require constant attention and repairs like newer machines do, due to the lack of people playing them, so they can be tucked into their own section and almost be left alone. You probably want to know what effects the memory issues and features have had on the overall scope of the game and release plans for the game. Well, unfortunately the game’s scope has had to be taken down a bit. The first version will not be 10 years long and 100 games in size as was the original plan. It will be brought down to 5-6 years. However, there will be at least one machine released per month during the game so around 77 machines (as 5 are available from the start). We found that when there wasn’t enough machines released in a year, buying them became too easy and the game less engaging. In a play through of the game now, it is often that you don’t have enough money to buy the latest and greatest in the first couple years. That added a level of strategy for how and when the player decided to pick and choose the games they do want. We have also had to lengthen the time a single month takes from 2:00 to 2:30 minutes. When the game was past the two year mark and you have 30 machines to manage it was impossible to take care of all of them. With the extra 30 seconds the game is more managable but still manic. That means the shortest time the 5 years can take is 150 minutes. In our playthroughs we spend an extra 10 minutes per year in the menus so a single 5 year playthrough is around 200 minutes or 3.3 hours. It would still be likely that you wouldn’t see everything the game had to offer in that time. Does this mean Arcadecraft will never see 1986 and beyond? We still plan on updating the game after release if there is a good player base and if the game is popular! We personally want to build into the 90s and give players a new environment to work in! As far as actual release of the game, we are planning on having the game into Xbox Playtest and Peer Review come the middle of December. Seeing as though gamers are already saturated with big holiday titles we don’t think it wouldn help Firebase to have it compete for gamer time and money against huge 100 million dollar games. That time is better spent making the game as stable and feature rich as we can! All being well, the game should be releasing after the first or second week of January 2013. We know it seems like a long time to wait but we are just as anxious to have this game in your hands! Thank you for all your interest in Arcadecraft!